First up is Jack O Lantern, an orange jelly with iridescent flakes that shift through green, orange, and gold. This is one-half of a Halloween Duo, each of which is priced at $12. The companion to Jack O Lantern is Goblin Greed, which has a brilliant green base. This is a jelly polish so it is of course going to be sheer. I’ve used 3 coats, plus Frosted Glass, then Liquid Glass. The flakes do stick up, so at least two coats of top coat will be a must. Next up are two polishes as part of The Witches Brew collection: Eye of Newt and Wolfsbane. Since the polishes themselves were to look like potions and the bottles easily lend themselves to that, of course names had to match. The Witches Brew collection has 5 total polishes, which also include: Mummy Dust, Snake Venom, and Ravens Claw. They all have a black jelly base with shifting iridescent flakes, holographic shards, and iridescent pigments. Each will be $12 or the set for $50. Wolfsbane is a black jelly base that shifts with blue, green, and purple. This is 2 coats plus Frosted Glass, then Liquid Glass. The flakes do stick up but again, 2 coats of top coat should fix that right up. Because of how much is packed into this polish, it applies a bit thickly but it isn’t unworkable at all. Eye of Newt is again a black jelly base that shift from fuchsia to bronze, and green. This is 2 coats plus Frosted Glass, then Liquid Glass. The flakes do stick up, but it’s easily solvable! It didn’t apply as thickly as Wolfsbane but was still on the thicker side. 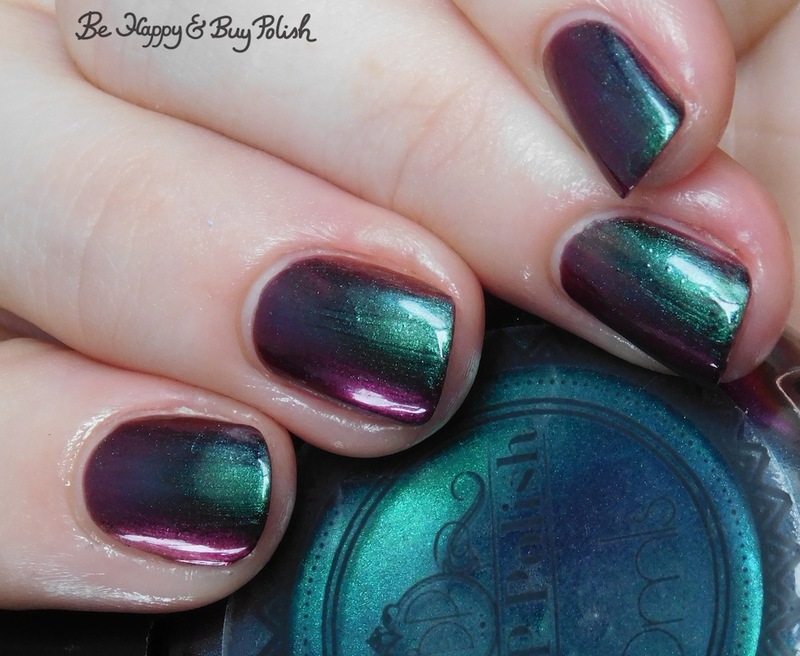 The next polishes are part of the Oil Slick quad, two of which are back from last year’s Halloween collection. Scared Slick and Trick or Slick are back from last year and the two new additions are FrankenSlick and All Hallows Slick. The quad can be purchased for $50. Scared Slick has a primary color of dark green that also shifts to blue, purple, pink, bronze and gold. This will be $12. This is 2 coats and no top coat. This is thinnish but not runny and covers well in 2. I can’t wait to show you the mani I created with this one! FrankenSlick has a primary color of pastel green with shifts to grey, blue, pink, and gold. This will be $16. This is 3 coats plus Liquid Glass. This is sheer but builds well and has a good formula. From left to right: Liquid Glass, Radioactive Glass, and Frosted Glass. As I said before, Liquid Glass has become my go-to quick dry top coat lately. Radioactive Glass is an insanely bright blacklight reactive top coat. I did find that it tinged the polish it covers slightly blurple. Frosted Glass, as you can see from my photos above, is really smooth and lovely. These are $7 each or the set for $18. Okay, so tomorrow I’m going to show you more photos – I created some manis with these polishes you are going to just love! Eye of Newt is my favorite.